← Information Regarding Dementia and “Sundowning”. 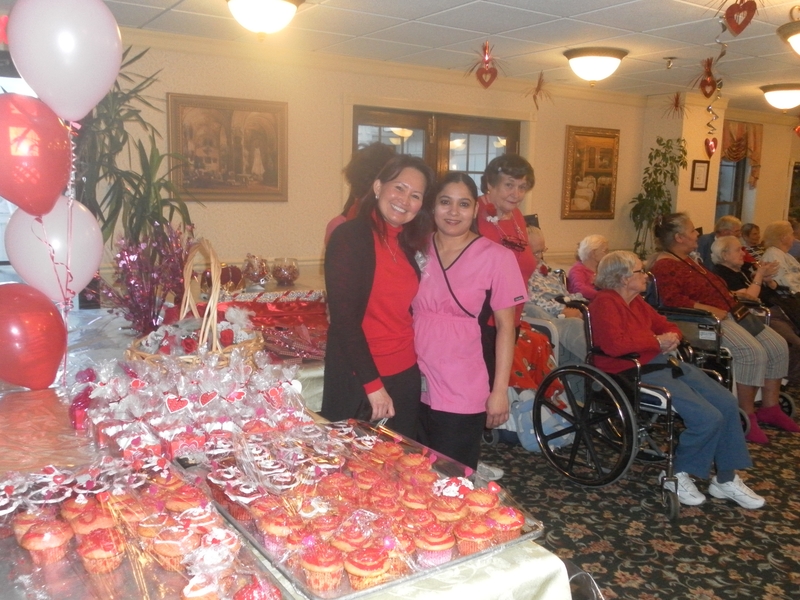 Regency Grande Nursing and Rehabilitation, Hosts Valentine’s Day Event! Posted on February 22, 2013	by Judah Gutwein, L.N.H.A. On Valentine’s Day, at Regency Grande Nursing and Rehabilitation Center, 65 North Sussex Street, Dover, and every day. Delicious treats, roses, music, and all the components that reflect a very special Valentine’s Day was provided to those who reside at the facility. This event held on February 14th, to provide a wonderful afternoon for the residents, staff and family members. Each year Regency Grande has a special celebration to commemorate a Queen and King in the facility in honor and in celebration of Valentine’s Day. Regency Centers believes that every day “Caring Comes to Life”, and this is simply an example of some of the celebrations that take place at this warm, caring facility. Several couples are chosen from the facility, and based on some basic criteria, a King and Queen is chosen to reign throughout the year. Everyone from the Administrator, department heads, the staff members, and volunteers, participate in some way. Staff baked and wrapped special cupcakes for each resident. Everyone to joined in on the singing and dancing with residents to create a very festive atmosphere. Eleanor Sorbara, resident at the facility, who is approaching her 95th birthday, enjoyed dancing the “twist” with the entertainer performing. Eleanor was quite musically inclined, and made a real impression on all that enjoyed her energetic, agile dance moves. There were smiles throughout the room, and glowing faces. The winners of the King and Queen contest was John Bennett, crowned as King and Ana Tasco, crowned as Queen. 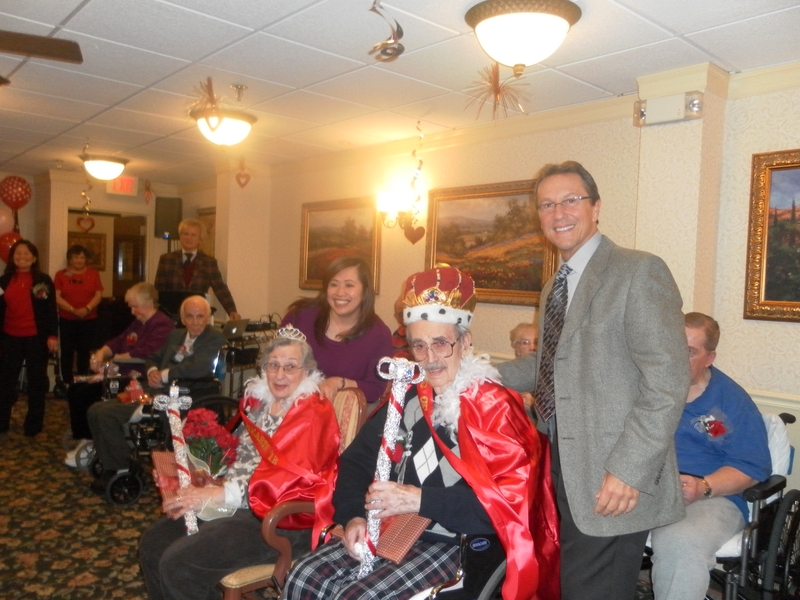 The King and Queen were attired with their capes, sash, and scepters and of course crown. Each of these items was presented individually to the recipients by a Director at the facility. The couple was thrilled, as was all the contestants, who received something special to commemorate this event. After the ceremony the music continued to play, singing and dancing continued, laughter throughout the room, the treats were handed out and there was another day of “love in the air” for these special residents at Regency Grande. Regency Centers are always striving to host unique and enjoyable events for the residents and community. On May 19th, 2013, at Regency Jewish Heritage Nursing and Rehabilitation Center, 380 DeMott Lane, Somerset, NJ, is hosting a special celebration for centenarians to break a Guinness Book of World Records Attempt, for “Largest Gathering of Centenarians”. Last year, Regency Jewish Heritage, was privileged to host a luncheon with 22 centenarians, and attempt to exceed that number, and invite all centenarians that would like to attend. Regency Nursing Centers cumulatively are honored to have a dozen centenarians reside at the Regency facilities. This entry was posted in Regency Resident Spotlight, Regency Staff Spotlight, Senior Care and tagged regency grande dover nj, regency grande in dover nj, regency grande nursing, regency grande nursing and rehab center, regency grande nursing centers, regency grande rehab center. Bookmark the permalink.